I've been using it since May 2012 when I bought it secondhand in very good condition. I've used it for party venues with a M57 mic connected to a small PA system, It has never disappointed me. I've played orange, marshall, laboga, which are slightly superior in terms of quality. I love its moderate weight, the sound it delivers with the 2 celestion v 30, considering that I just did a mod by disassembling it, throwing out the foam, adding some glue to the internal panel joints, varnishing the interior with 3 crossed layers, weatherproofed the handles and added some sanitary seal to the binding posts. If I had to, I'd buy it again. I play pop with a gretsch power and a caiman laboga. I play short solos with distortion and it's very good for that. Pat Flam's review"Excellent, after a long run-in"
I've had it for 2 years. I have tested all sorts of cabinets, Especially Marshall and Orange. This one is truly excellent. But be careful, I didn't use it for quite a long time, had no interest in it because new, it sounds stiff, sharp, ugly, pretty bad. But gradually the speakers and the sound became smoother and then I was able to recognize the quality of the V30s. It's well-defined, dynamic, they respond remarkably to attacks. It's perfect for blues, jazz, country, and Stones-like rock, obviously. Big rock sounds great. Clean sounds are sublime with this cab. For a more creamy sound, in another cab, test a Celestion greenback and you'll get a wider scope. What I love about this cab are its price and sound (after breaking it in). Colinou03's review"Nothing to say, except that it's not expensive and it sounds good!" I'm entirely satisfied with this product. 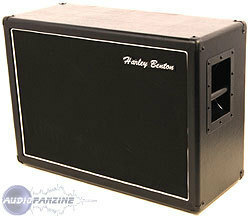 For 195 euros, which is almost the price of the two speakers alone (celestion v30, I love them), you get the whole cab. Good finish, sturdy enough (but be careful since the tolex isn't too thick), it sounds (almost) like a 4x12 and your back will be very grateful!!! I intend to buy another one later on. It's practical both for rehearsals and gigs. And, I repeat, in terms of sound, it has nothing to envy certain renown brands. 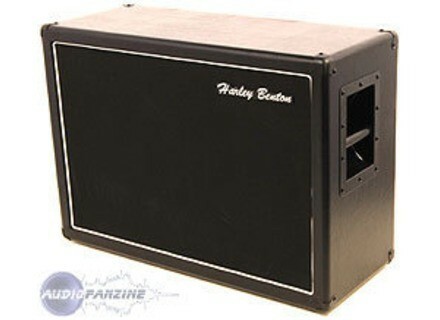 A knowledgeable friend of mine even told me this Harley Benton sounds just as good or even better than a Soldano 4x12 he has... Personally, I also have a 4x12 tech 21 with the same speakers and, to be honest, the difference is not that big. Very good value if you do not have to do the scene and repeated use at home or like me. The PB is that HP celestion are OK, the finish is correct against the box is by melamine and is less solid than solid wood cabinet and resonates a little less. I hope you have help. mookie blaylock's review (This content has been automatically translated from French)" Very correct"
Short for a first baffle is perfect! nicolasmarty-omega's review (This content has been automatically translated from French)" good deal"
for those who did not like me too much money this is the perfect subwoofer is not of very good quality but certe yaal inside 2 hp v30 celestion who dislocated ca ......! and that costs almost 100 euro each unit so you quickly calculate the small Chinese thank you "it's ugly life"
jecee's review (This content has been automatically translated from French)" Super value!" Then I told myself that instead of slamming EUR 2000, I was going to attempt a manipulation to 200 euros by changing the HP from my cab. So last week, I made this manip: 198 euros for the HB in 2x12 V30 (received in 2 business days), 6 euros Cable (2.5) and 1 euro for the base jack, total 205 euros. Dismantling of the 2 hp G12t75 marshall, dismantle all the wiring of origin (even finer than that of HB), installation of V30 Cross, and REWIRING complete with direct solder lugs on the HP and I replaced the plate printed circuit by a female Jack Mono. Silicone on all interior edges. Reassembling everything and hop check with the multimeter: baf 4 ohm! Damn, I had Uygur somewhere! Anyway, I just looked and finally I had forgotten to wire a connection between 2 HP .... So now I'm only 16 ohm mono and everything works perfectly! Since then I've played 4 good hours on the cab with my head, TSL100, and frankly the change of HP is super gross! I will leave a notice after one rehearsal to get a real idea of rendering 1960a amended in the mix. End of the demonstration: V30 + G12 = Excellent Mix for 200 euros and 2 small hours (I had never welded before and frankly super simple).